← Is Quebec’s Valeant (VRX) a Wall Street Ponzi Scheme? This summer CMR published a report on Tourmaline Oil Corp (TOU). We showed that the company sucked up cash harder than a black hole and becoming economically viable was nigh mathematically impossible. Their strategy has been nothing more than bigness. They were not building a strong company and making acquisitions with internally generated cash, Instead, they gobbled up the proceeds fed to them by fanciful underwriters to buy assets so they could constantly trumpet record production numbers and drive up the share price. While Tourmaline’s C-suite speculators kept devouring funds with their capex and M&A binge, they were striving for a Hail Mary liquidity event when some bigger E&P company would hopefully buy them at a nice valuation. The company just released its Q3 results and has only provided further support to this thesis. Tourmaline is still spending too much money with little to show for it. CMR analyst Daniel Plainview provides us with an update. A follow up from the quill of Daniel Plainview, Esq. It has been a number of months since I took to this forum to share with the fine readers the patent market absurdity that is Tourmaline Oil. While its shares have fallen since the summer (about 30%) this is by no means out of line with the declines of other Canadian oil gas companies. Recently another quarter of financial results was announced, so perhaps it is a good time to see if this company has finally made a dollar. Cash flow from operations were together another C$ 412 million, but spending (net of $0 new asset sales) was C$ 719 million. 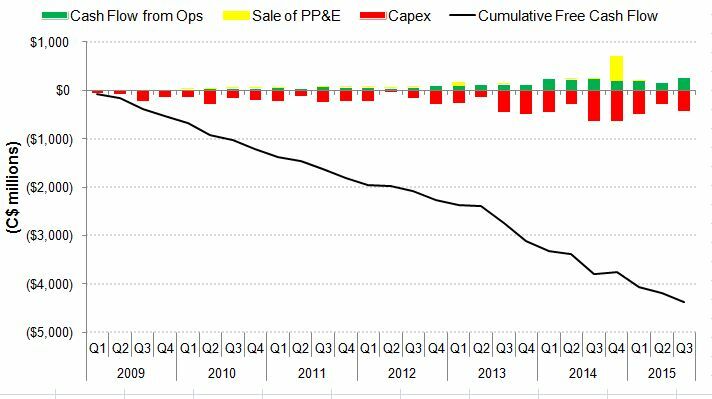 Free cash flow was therefore -C$ 307 million for the last 6 months, bringing the grand total money pit to ~C$4.35 billion since 2009. A positive development might be that it appear the company is now aware that they cannot promulgate cash flow and earning figures without the accompanying capital expenditures that drive the production. In their October 14th press release they have budgeted free cash flow projections for 2016 and 2017. In a low gas price scenario they free cash flow will be ~C$45 million followed by ~C$167 million, and in a high gas price scenario free cash flow will be ~C$103 million and ~C$414 million. So hypothetically, at the high price scenario, investors might see positive cumulative free cash flow some time in the 2020s, but I won’t hold my breath. Also worth noting is that the low gas price scenario assumes a median C$3.25/mcf price for Alberta natural gas. Presently it sits at ~$2.40/GJ (or ~$2.53/mcf); so they only need their base commodity price to go up 28% too. This is a company that grows production at any cost and has never had an economic business model. It requires constant issuance of new shares and cannot maintain growth on a per share basis if valuations drop. It is a house of cards waiting to fall. It’s enough to make Tourmaline shareholders sweat.